A unique carded preparation for hand spinning or felting. All colors in this blend are natural colors derived from indigo plant dye & gray wool. This listing is 4 ounces of carded blue & gray tones with textures and character. This blend will produce a lofty, durable yarn with a soft halo and beautiful felted fabric. Blue faced Leicester wool locks and yearling mohair raised here on our SD farm are dyed using natural indigo plant dye. 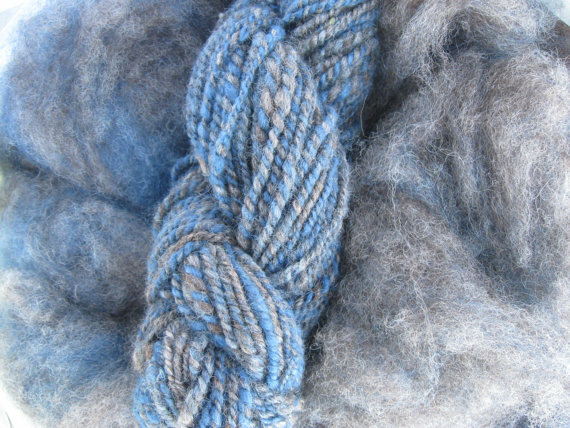 These beautiful blue locks are then hand blended and carded together with a natural grey Border Leicester wool fleece and natural gray, fine grade Alpaca. Our carding mill opens up the locks and cards the fibers into a fluffy cloud which will spin a lofty woolen yarn. This preparation works well for felting also. Spinners accustomed to commercial combed top, which can be dense and require significant predrafting, will likely find this carded preparation easier to spin. The fibers are processed gently to help retain the unique characteristics of each fiber. Long healthy locks sustainably raised.